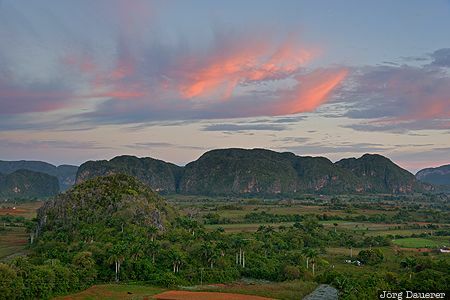 The green Viñales Valley (Spanish: Valle de Viñales) with its typical limestone cliffs (mogotes) and a lone farm house below a colorful sunrise sky. Viñales is in the province Pinar del Río in the west of Cuba. This photo was taken in the morning of a sunny day in March of 2016. This photo was taken with a digital camera.